‘Round here, we’ve been trying to introduce more whole foods and organic products into our diet. Back to nature is something we’re doing for the health of our body and mind. 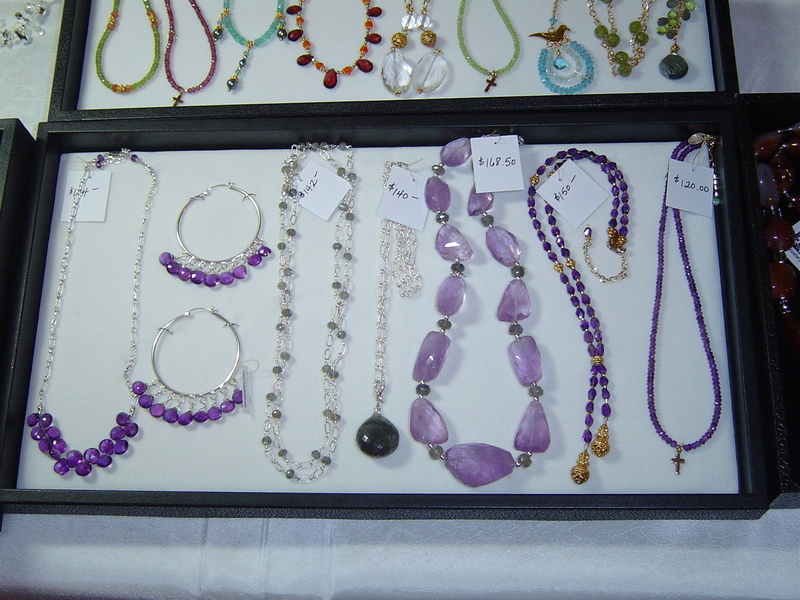 And it got me thinking about introducing more natural looking beads in my jewelry as well – you know for a more zen feel. To me, nothing says natural more than these gorgeous agate beads. They remind me of stone collecting when I was a kid; asking my dad for a hammer and breaking open stones to see what was inside. Or skipping stones – growing up in the land of 10,000 lakes we used to look for smooth flat stones just like these. Botswana Agate – gorgeous circular patterns reminiscent of shells by the sea – shades of grey, taupe, browns, and even orange just for pop. If I were going on holiday this winter it’s what I’d wear with my white linen. For now wear them with a light grey cashmere sweater over charcoal grey or espresso trousers for work. Yes you can mix brown and grey – nature does it beautifully and so can you! I call it effortless. Much time has passed since my last entry and much has happened. A couple weeks ago my computer had started crashing so I ran spybot, cleaned the disks and defragged. Then Adobe Photoshop no longer worked so I unloaded it and reloaded it – when it asked for the update I went to Adobe and downloaded that and the software still won’t open a photo. So, I found Gimp on the web and have been trying to learn a new photo editing system – not an easy task. 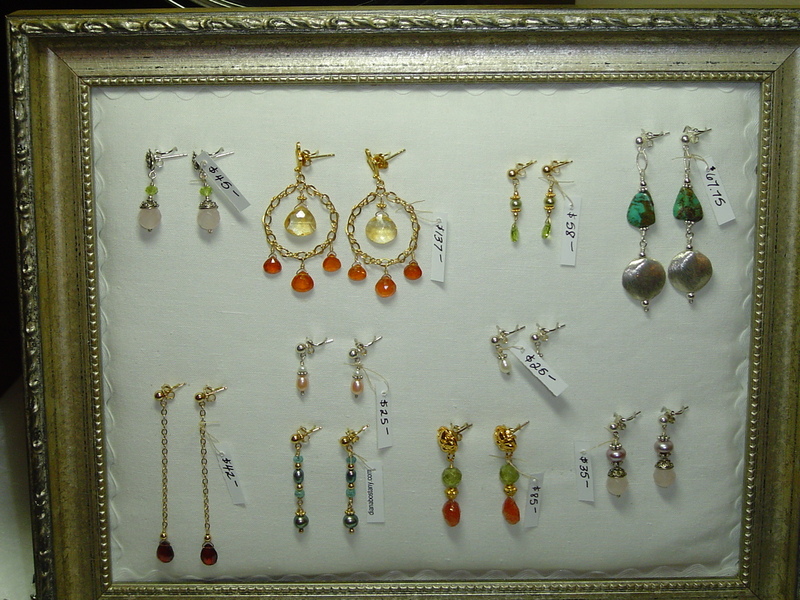 Recently I did a jewelry show. 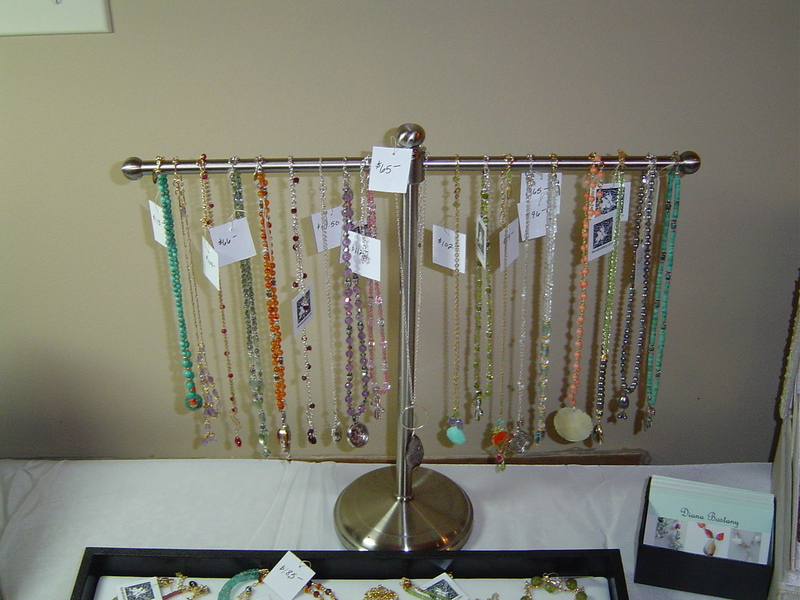 Doing your first jewelry show can be a blog posting in itself but I won’t bore you with the details. 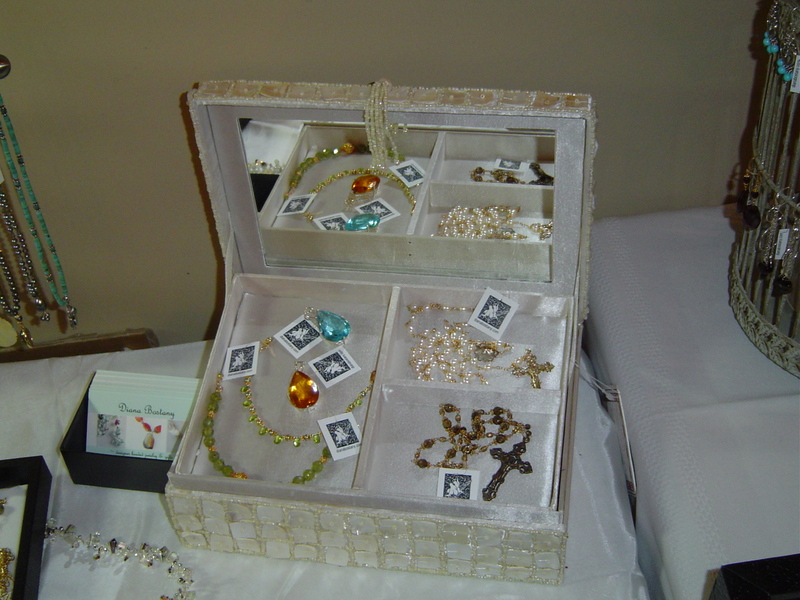 It took many hours of preparation, cost about $200, and I sold one necklace. I’ll chalk it up to a good experience and take comfort in knowing that at least now I have everything I need to do another. 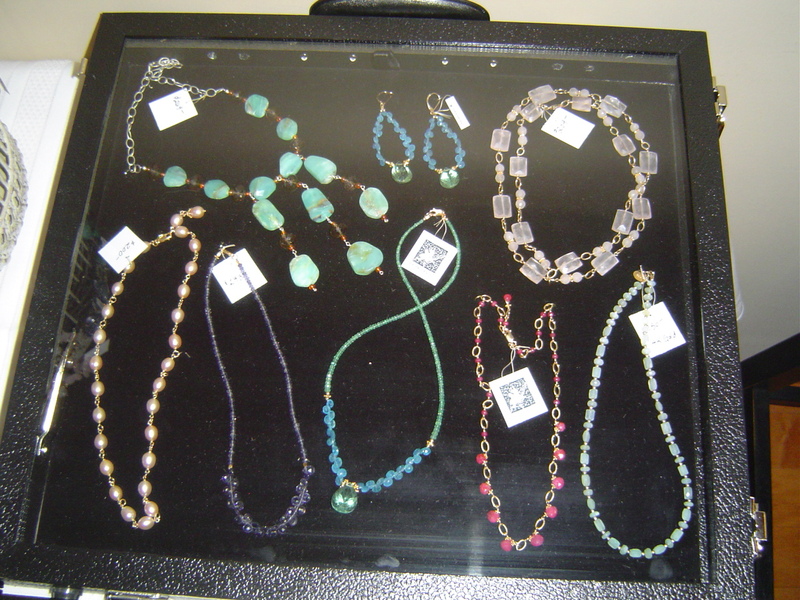 Here are some display ideas. I’ve been working on a consignment for special occasion jewelry – necklace with matching earrings using Smokey Quartz, Chocolate Pearls, and Gold. The look I was going for was romantic yet bold. Romantic because the brocade jacket the customer would be wearing had a lovely portrait collar – reminiscent of Queen Elizabeth. And bold because the jacket had a large portrait collar – what do ya know? Scale is very important. I was lucky to have in my stash some huge heart shaped briollettes. Last Thursday, I suffered a second degree burn while cooking dinner (don’t worry, I’m not going to post a picture). It’s surprising how fragile we can be. The burn, which is the size of a grapefruit and caused me to seek medical attention, was extremely painful and had I not had Tylenol with codeine, I don’t think I could’ve slept a wink. The next day wasn’t as bad as I’d thought but the next few days . . it was difficult to do many things I take for granted – like taking a shower – didn’t want to get the burn wet; doing household chores or making jewelry – it was painful to do just about everything as the entire burn throbbed most of the time. To end a long story, I’m much more careful about lifting the cover off of a boiling pot on the stove. Last but not least, I opened an Etsy store. Why have an Etsy store when you already have a website? This will have to be another post.